CBDT issued a notification no. 5/2017 dated 29 May 2017 about TDS and filing of ITR in case both the parents are dead of minor. Full notification is as under. other relative. Ideally in such type of situations, the income should be assessed in the hands of the minor and the income-tax returns be filed by the minor through his/ her guardian. 2. 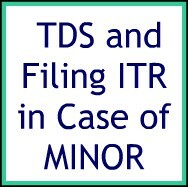 Under sub-rule (5) of Rule 31A of the Income-tax Rules, 1962, the Director General of Income-tax (Systems) is authorized to specify th e procedures, formats and standards for the purposes of furnishing and verification of the statements or claim for refund in Form 26B and shall be responsible for the day-to-day administration in relation to furni shing and verification of the statements orclaim for refund in Form 26B in the manner so specified.